The E-Pace will rival the likes of the BMW X1, Audi Q3, Volkswagen Tiguan, and Mercedes-Benz GLA-Class. 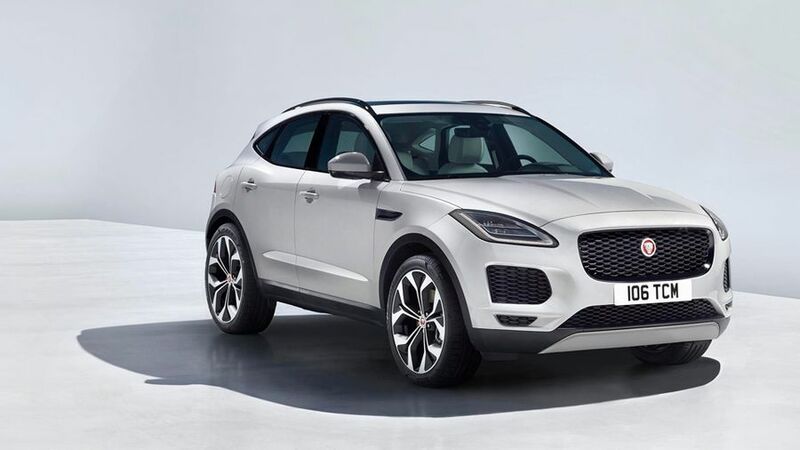 Jaguar has revealed its latest new model, the E-Pace, which is available to order now from £28,500. This small SUV is a similar size and price to the BMW X1, and Audi Q3, but could also be a rival for the Volkswagen Tiguan (slightly bigger and cheaper), and Mercedes-Benz GLA-Class. This car follows the launch of the bigger F-Pace in 2016. It's a five-seat family car with all-wheel drive, that can tow up to 1,800kg. From the front, the car is obviously a Jaguar. It’s got the company’s distinctive grille, with quite an aggressive stance thanks to its proportions and short overhangs at the front and rear. The optional advanced LED headlights are similar to the ones of the F-Type, and feature Jaguar’s J-blade daytime running lights, which run around the edges of the headlights. At the rear, there’s slim, blade-like rear lights with full LEDs. Buyers can choose from a body-coloured, black contrast, or fixed panoramic roof, and there are 11 colours to choose from. And the E-Pace comes with the option of 21-inch wheels, along with 11 other wheel possibilities. There’s plenty of leather and chrome around the cabin, and every car comes with a ten-inch touch-screen infotainment system, with a customisable home screen. The system can connect to apps such as Spotify, and can be operated by swiping, pinching, and zooming. A 12.3-inch full colour digital instrument panel is available as an option, along with two premium audio systems. The built-in sat-nav can work even when a GPS signal can’t be received, and you can share estimated arrival times by text or email. Commute Mode learns your daily drive so it can offer alternative routes, and Arrival Mode shows a 360-degree interactive view of your destination when you’re 200m away, and suggests the nearest available parking spaces. 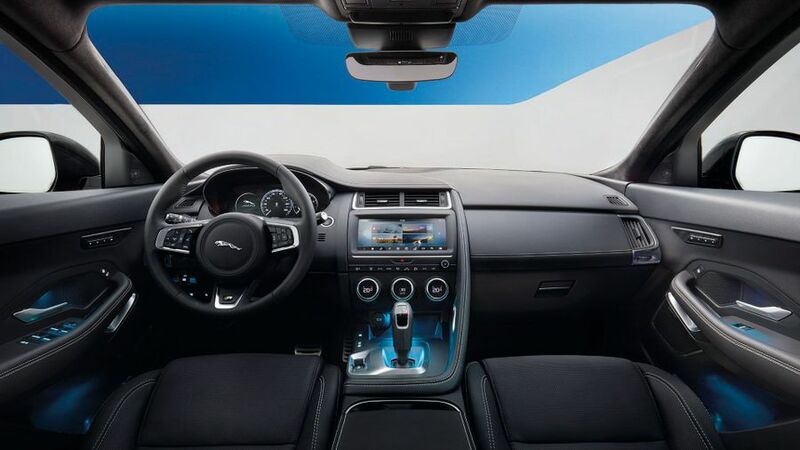 Jaguar’s next-generation head-up display is also available. It can project up to 66% more information than the previous model onto the windscreen using large, full-colour graphics. 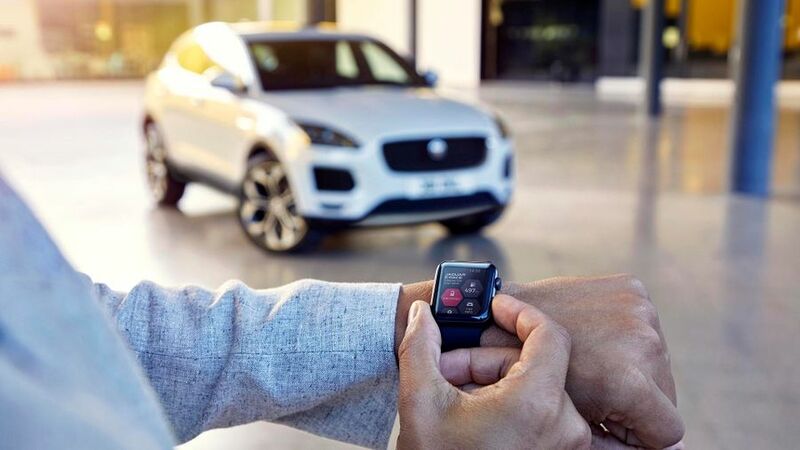 Vehicle speed and navigation directions are in view at all times, with alerts and updates for infotainment, safety, and convenience appearing when needed. Around the cabin, there are up to four 12-volt charging points and five USB connections, as well as a 4G wi-fi hotspot for up to eight devices. And plenty of space to store small items, with a large centre console compartment, cupholders and trays, a large glove box, and rear door bins. bumper and it’ll open the boot. On the options list is the Activity Key. It’s a waterproof and shockproof wristband which allows the driver to lock the main key inside the car (which is disabled), and head off to go scuba diving, cycling or running. The E-Pace and E-Pace R-Dynamic – the sportier model – are available with S, SE, and HSE spec packs. And there’s a choice of three diesel and two petrol engines. 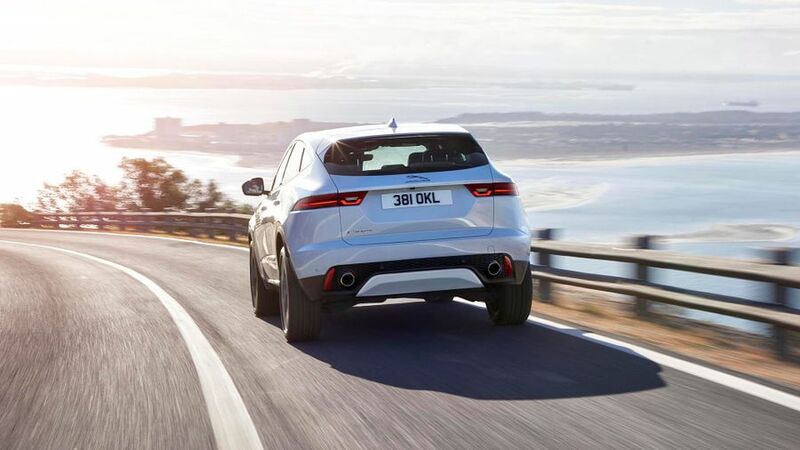 The E-Pace is the first Jaguar available with only Ingenium units. The 2.0-litre four-cylinder diesel is available in 150PS, 180PS and 240PS, and the two 2.0-litre four-cylinder turbocharged petrol units deliver 249PS or 300PS. The engines are paired with either a nine-speed automatic gearbox, and the 150/180PS diesel engines are available with a six-speed manual gearbox. All-wheel drive is standard on the 150S/180PS diesel models, and the 249PS petrol. On a slippery surface for example, the system can send almost all the engine’s power to the rear if the front axle loses traction. Drivers can choose settings for the throttle, automatic transmission, steering, and if chosen, the adaptive dynamics suspension system – which improves roll control and agility in all conditions. A stereo camera enables the advanced emergency braking system (standard) with pedestrian detection, Lane Keep Assist, and Traffic Sign Recognition, as well as the Adaptive Speed Limiter and Driver Condition Monitor (standard) features. The camera also works with the electric steering system to deliver a Blind Spot Assist function. There’s also a new Forward Traffic Detection system, which warns drivers of approaching vehicles at junctions where visibility is restricted, and a pedestrian airbag, to help protect pedestrians in the event of a collision. Adaptive Drive Beam can adjust the pattern of light beams to prevent them from dazzling other drivers but without compromising visibility, Park Assist can steer the vehicle into parallel and bay parking spaces, and Front and rear parking aids are standard on every vehicle, to help with tricky manoeuvres. 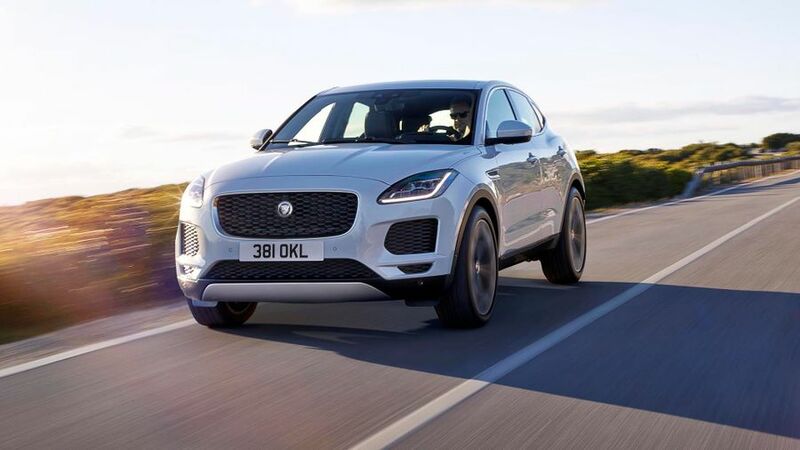 The new Jaguar E-Pace is available to order now, costing from £28,500.